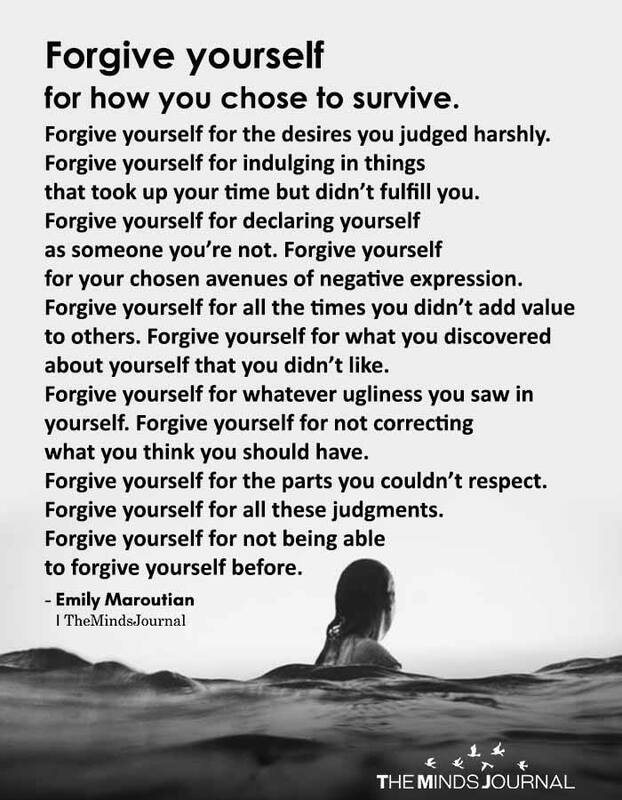 Forgive yourself for how you chose to survive. Forgive yourself for the desires you judged harshly. Forgive yourself for indulging in things that took up your time but didn’t fulfill you. Forgive yourself for declaring yourself as someone you’re not. Forgive yourself for your chosen avenues of negative expression. Forgive yourself for all the times you didn’t add value to others. Forgive yourself for what you discovered about yourself that you didn’t like. Forgive yourself for whatever ugliness you saw in yourself. Forgive yourself for not correcting what you think you should have. Forgive yourself for the parts you couldn’t respect. Forgive yourself for all these judgments. Forgive yourself for not being able to forgive yourself before.